I read this book about a month back and reviewed it over at 5 Minutes for Books. I planned some follow-up thoughts which I wanted to share over here, but unfortunately got sidetracked and am just making my way back to it! There is simply so much in this 600 page book to cover and discuss concerning the life of Dietrich Bonhoeffer that it's hard to limit one's self to a simple review of the book. What I said over at 5 Minutes for Books still stands, of course. I just wanted to share some quotes from this book which make Bonhoeffer stand out, to me, as someone to be admired. First off, to help you understand Bonhoeffer a little bit better, you should know that he is from a family of eight children. His father was a prominent psychiatrist/neurologist in Germany and his mother was a German countess. Their family was well-connected in Germany and their home a happy one. They loved Germany fiercely and proudly and it broke their hearts when Hitler came into power and destroyed the country that they loved so well. It was rather shocking when young Dietrich declared that he meant to grow up and be a theologian. His father was not a Christian and his mother was more religious, I think, being the daughter of a theologian herself. What I loved hearing about was how serious German seminaries took their doctrine and theology. There was nothing "fluffy" about saying that you wanted to become a minister. Becoming one involved an in depth study of the scripture, constant argument and proving of one's belief system, and whole hearted devotion. This is the seminary system that Dietrich was educated in. In fact, when he came to America he was rather appalled at how loosely Americans held to their faith. He felt that this country did not take their faith very seriously. So said one who essentially laid down his life for what he believed in. Bonhoeffer took his beliefs very seriously. For anyone who has ever had to go up against their family on a matter of faith, you know how truly difficult this can be. Dietrich believed in God though and there was no turning back for him. He was consistent in his beliefs and his statement throughout his lifetime. I think too often today we think that our faith is a private thing. It's something that should be lived internally and not externally. We don't feel like we want to go around rocking anyone's boat and so we keep our opinions to ourselves and try not to create conflict. Certainly 'in as much as is possible' (Romans 12:8) we should live in peace with all men, but that verse does not command silence or faith to be confined within the four walls of your home. Furthermore, Christians today are less open with one another. Potlucks are a chore. Inviting people into your home to fellowship with them is almost unheard of! We've forgotten to live alongside one another, sharing our faith and making it real. We segregate ourselves into denominations or, when we can't find a church to suit ourselves, we go and create churches of one. We live alone. That's not living by faith and Dietrich became a proponent of living in fellowship and community with other Christians so that the gospel message would be more fully realized. That is a pretty powerful statement. I think it stands alone so I'll not comment on it. In any case, Dietrich Bonhoeffer made his choices and I struggle with them to some degree. So did he. At the memorial service which was held for Bonhoeffer in England, they sang the hymn "For All the Saints" which, having taken a peek at the full lyrics, I think is quite fitting. Certainly there is a lot to think about in reading about the life of Dietrich Bonhoeffer. For my part, I walked away inspired, touched and moved by the conviction and belief that this man lived his life by. I'm glad to have had the opportunity to read this biography and learn more about a rather remarkable man who lived during a remarkable period in history. I did not realize he was involved in an assassination attempt. He was a remarkable man. 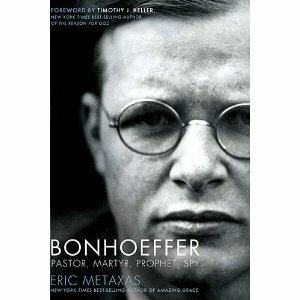 Sounds like a great book to read if you want to know more about Bonhoeffer. I have always wanted to learn more about him as I have heard him mentioned here and there. The size of this book makes it a little daunting, but I will keep it in mind. I am 150% in agreement with you about not killing abortionists or anyone else by taking matters into our own hands outside the governmental authority structure. I believe Cal Thomas (?) reviewed this book in an editorial last week. (I'm not sure it was Cal Thomas, but I think it was.) I thought it was the same book you read. I wrote a paper on Bonhoeffer in college. I'll definitely have to try to find this book and read it! You give your readers so much to think about...without even reading the book for ourselves. Despite all the reading I've done about WWII, I never heard of Bonhoeffer until reading your thoughts on this book. This sounds fascinating, and I hope it's okay to link to your review on War Through the Generations. Thanks for the review. I have read Life Together and was very challenged by it. I think I might have to check this bio out because I'm very interested in learning more about this remarkable man.